Samsung's biggest challenge isn't deciding what to add to its new smartphones, but figuring out what to leave off. Its latest flagship phone, the Galaxy S5, is still busy and scattered. But the Galaxy S5 shows that Samsung (SSNLF) is beginning to take a more cautious and thoughtful approach than with its Galaxy predecessors. Unfortunately, adding flashy, unnecessary features is required for marketing a smartphone these days. The Galaxy S5 has its share -- some successful and some forgetful. The big new additions include an Apple (AAPL) iPhone-like fingerprint sensor, a heartbeat sensor, water resistance and a new focus on health tracking. The fingerprint and heartbeat scanners don't work as well as they should. The fingerprint sensor adds an optional level of security to the phone and certain files, and it could eventually be used for payments. Unfortunately, it's tricky to master and requires clumsily moving your finger or thumb over the home button. The heartbeat sensor also needs improvement. To use it you press and hold a finger on the back of the phone. It gave me an accurate reading every time but was repeatedly unable to detect any cardiac activity in my partner, who I now worry is one of the undead. The most welcome addition is water resistance. Our poor, expensive gadgets are regularly subjected to a number of damp indignities. They're dropped in toilets and pools, soaked by spilled drinks, and gnawed on by drooly babies and dogs. The people using them as fitness devices are probably adding some sweat to the mix. The Galaxy S5 is water- and dust-resistant and can last up to 30 minutes submerged in a meter of water. Though it's not guaranteed to be fully waterproof it might prevent a few early smartphone deaths. After taking into consideration customer feedback and usage statistics for its previous software features, Samsung cut down the number of pre-installed apps weighing down the phone. Realizing many of those apps should be optional, Samsung has stashed a list "Galaxy Essentials" apps in one spot so customers can decide which ones they'd like to download or ignore. The result is an improvement over the Galaxy S4, but it's far from perfect. At times, the interface can feel disjointed and busy instead of cohesive and intuitive, like it was designed by committee instead of a tight team of user interface designers. And, of course there are still the usual bloatware apps from carriers to contend with, nothing a few minutes of deleting can't clear up. For most customers, the fun add-ons and software are just window dressing. The true test of a phone is its core features such as speed, battery life and camera quality. A new quad-core Qualcomm (QCOM) processor inside the phone keeps everything speeding along. The battery is bigger, rated for up to 21 hours of talk time. When the juice is low and you're nowhere near an outlet, the very handy ultra power-saving mode can drastically drag out the device's life. The screen switches to a white-on-black display and only essential communications are supported. It's pretty genius. A smartphone's camera is a key feature for shoppers -- so much so that Nokia (NOK) has made super-powerful cameras the primary selling point of its Microsoft (MSFT) Windows Phone devices. The Galaxy S5 camera is sharper than the S4 with more pixels packed in to the same-sized sensor, with some new software features. Many of the software add-ons are the same types of filter and editing options you can get with third-party camera apps. Samsung says the focus time is faster, but the camera can still be a touch slow when image stabilization turned on. A nice addition is the real-time HDR feature, which combines two different exposures of the same scene in preview mode, so you don't have to wait until after you snap a photo to see if it looks good. HDR also works for videos. The physical design of the phone is, like its predecessor, inoffensive. It mixes plastic and a faux leather back for a look that's nice enough on the eyes but feels a little cheap. On the bright side, phoning it in on materials keeps the increasingly large phone light. Samsung doesn't have Apple's eye for high-end design details and materials, or the Moto X's flare for fun customization and color. Instead the company put more attention into part of the phone that you'll be staring at all day: the screen. Samsung slightly inflated the Galaxy S5's screen size from five inches to 5.1 inches, adding a nice but subtle amount of screen real estate. The AMOLED 1080p HD touchscreen display is outstanding and sharp with vivid colors. 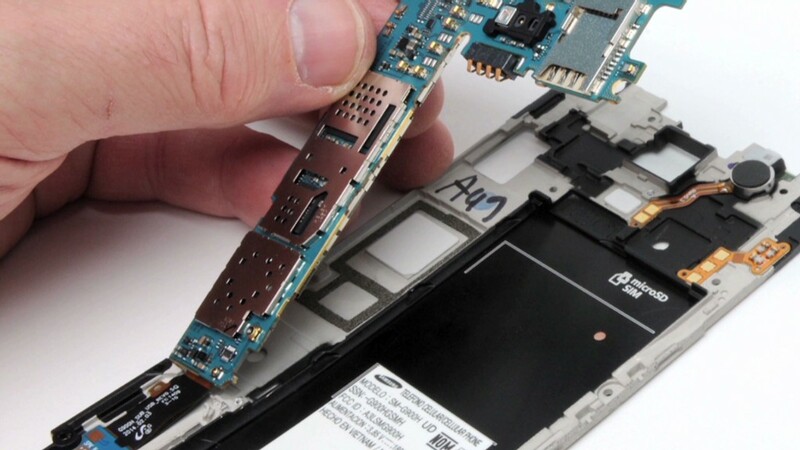 Many of these details will probably be beside the point for the Galaxy S5. It is one of the most popular smartphones in the world, particularly where Google's (GOOG) Android and Samsung fans are legion. For those who want a top-of-the line Android phone, most pick up the latest Galaxy S.
That popularity might be why the company is hesitant to make any radical changes to the device. Instead of reinventing the Galaxy S4, Samsung is refining it, honing in on what makes it a success and throwing in the types of features that are unlikely to win over customers who don't already use Samsung products -- but won't alienate existing fans either.